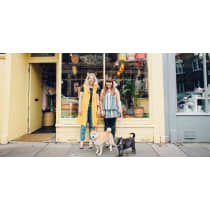 Artisans & Adventurers, located on Columbia Road in vibrant East London, was founded by accessories designer Amy Fleuriot and craft development expert Bee Friedmann who discovered a common love for design and sustainability after meeting whilst dog walking. Artisans & Adventurers gives traditional craft modern appeal by combining a minimalist aesthetic with a love of colour and print. The boutique features a range of handmade jewellery, designed in house in collaboration with artisan producers in Kenya, handwoven textiles and traditional African fabrics and designs. From chocolate to cushions and woven baskets, A&A's goal is to bring a little bit of joy to everyday objects. "The nature of the global supply chain means our decisions as consumers affect people all around the world. We strive to source products which bring as much joy to their creator as they do to the customer."